Yes, Portugal is quietly confident as it goes about its own business, but so strong has its property market been over the past decade it could be forgiven for shouting its praises from the rooftops. On average, house prices have doubled over the past 10 years and are tipped to grow at a rate of around 10 to 12 per cent in 2006 by several respected sources – this at a time when most of the “established” overseas property market countries are just about returning double-digit growth. Property in portugal is is a sound investment. Good old Portugal is one of Britain’s oldest allies, and the UK’s soft spot for its Iberian neighbour is still clearly evident today. In particular, as a nation we’re awfully keen on Portugal’s mild southern coast – we’ve all heard of the Algarve haven’t we ? A small army of Brits holiday in the Algarve each year and it’s thought that around 50,000 of us have gone on to purchase a property on this friendly stretch of bucket-and-spade coast. Most of these properties will be found in high-profile coastal golf resorts such as Vale do Lobo and Quinta do Lagos. 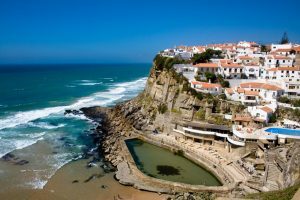 But, for one of western Europe’s smallest countries, Portugal has a lot more to offer the international property buyer than just sun, sea , sand and acres of fairway. Head further north and you’ll find a dramatic landscape backed by the rugged Atlantic coast…and the properties are a fair bit cheaper away from the south too. Having said that, the Algarve’s popularity makes it a good bet for seasonal buy-to-let purchases. A small apartment here will set you back around £80,000 to £100,000. Further north, the Silver Coast (aka Lisbon Coast) has been attracting more tourists in recent years and has therefore become something of a hotspot among international property speculators. Another area worth noting is the Green Coast surrounding Porto in the north of Portugal. Porto is the home of the country’s world-famous fortified wine, Port, and as such is a wealthy area – and a region that happens to have a fair few decent beach resorts as well. Along with countries like France and Spain, Portugal is in the first tier of popular overseas destinations with us Brits when it comes to property investment. And, while it doesn’t promise the huge returns in terms of percentage that some of the emerging markets do, it’s a stable marketplace with a well-established tourism and rental sector. A mark of Portugal’s economic stability is that, since it joined the EU in 1986, its per capita income has risen from around half the European average to more than 75 per cent and continues to rise.